54 • RV PRO • November 2018 rv-pro.com O P E N H O U S E C O V E R A G E Rise of the Pop-Top Spirits weren't the only thing on the rise at this year's Open House. Those wandering the various exhibits didn't have to look far to see pop-tops on an array of products, including travel trailers, camper vans and specialty vehi- cles. 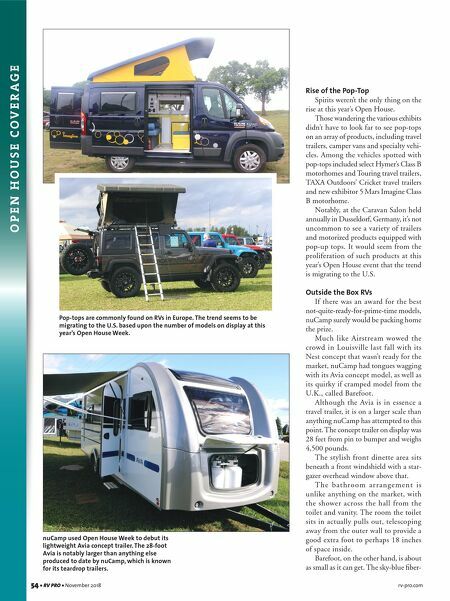 Among the vehicles spotted with pop-tops included select Hymer's Class B motorhomes and Touring travel trailers, TAXA Outdoors' Cricket travel trailers and new exhibitor 5 Mars Imagine Class B motorhome. Notably, at the Caravan Salon held annually in Dusseldorf, Germany, it's not uncommon to see a variety of trailers and motorized products equipped with pop-up tops. 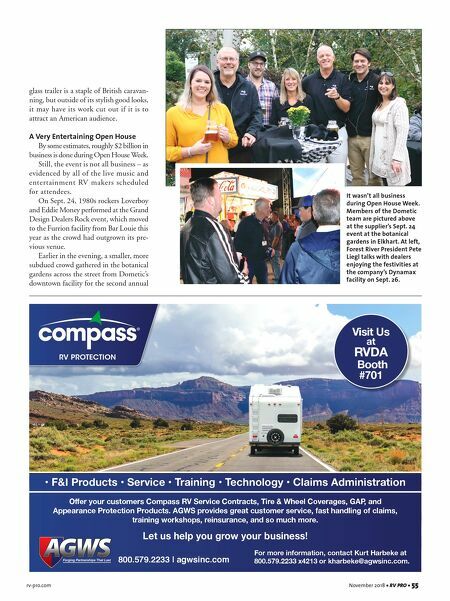 It would seem from the proliferation of such products at this year's Open House event that the trend is migrating to the U.S. Outside the Box RVs If there was an award for the best not-quite-ready-for-prime-time models, nuCamp surely would be packing home the prize. Much like Airstream wowed the crowd in Louisville last fall with its Nest concept that wasn't ready for the market, nuCamp had tongues wagging with its Avia concept model, as well as its quirky if cramped model from the U.K., called Barefoot. Although the Avia is in essence a travel trailer, it is on a larger scale than anything nuCamp has attempted to this point. The concept trailer on display was 28 feet from pin to bumper and weighs 4,500 pounds. The stylish front dinette area sits beneath a front windshield with a star- gazer overhead window above that. T h e b a t h r o o m a r r a n g e m e n t i s unlike anything on the market, with the shower across the hall from the toilet and vanity. The room the toilet sits in actually pulls out, telescoping away from the outer wall to provide a good extra foot to perhaps 18 inches of space inside. Barefoot, on the other hand, is about as small as it can get. The sky-blue fiber- nuCamp used Open House Week to debut its lightweight Avia concept trailer. The 28-foot Avia is notably larger than anything else produced to date by nuCamp, which is known for its teardrop trailers. Pop-tops are commonly found on RVs in Europe. The trend seems to be migrating to the U.S. based upon the number of models on display at this year's Open House Week.